Automotive technology donations – Michael Behrmann, chair, Southern Illinois University Carbondale’s Department of Automotive Technology, discusses the benefits of donations by Navistar International Corp. and Rush Enterprises, Inc. to the program. 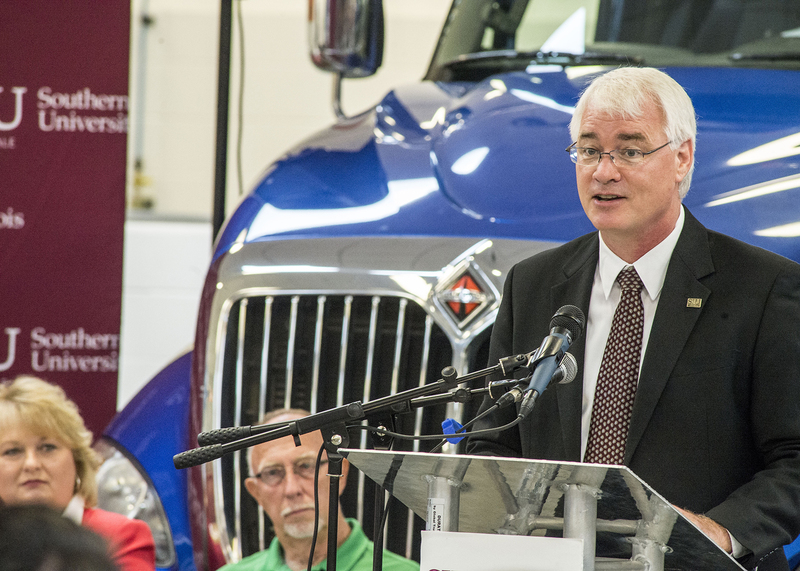 CARBONDALE, Ill. -- A partnership linking business, industry and education was celebrated at Southern Illinois University Carbondale today (August 25) with the announcement of donations to the university’s automotive technology program. Over the past year, Navistar International Corp. has donated nine newer model commercial trucks that include their Durastar, Workstar, Prostar, Transtar and Lonestar models, in addition to several engines, transmissions, driveline components and emission control components. Rush Enterprises, Inc., is supporting the partnership by providing licenses to Diamond Logic Builder, a software package that automotive students will use in labs to configure and program truck body controllers. The donations are integral to the university program’s success -- providing an important educational resource that meets industry needs and students’ demands, Andy Wang, dean of the College of Applied Sciences and Arts, said. “This college accomplishes its mission through its dedication and commitment to addressing the academic needs of students seeking opportunities to acquire high-level skills in specific technical areas for rapid entry into a global workforce. The donations from Navistar and Rush Enterprises will help CASA to advance its academic offering to achieve its mission,” Wang said. Michael Behrmann, department chair, said the donations have a “positive impact” on student learning. “These donations will allow our students to have access to the latest industry technology as they learn to develop diagnostic processes and problem-solving hypothesis testing,” he said. The donations also represent industry support in technical education, and science, technology, engineering and mathematics (STEM) fields at SIU Carbondale, Behrmann said. Both companies recruit SIU graduates. The program is considered the “nation’s premier automotive training program in providing technical and management graduates that are helping drive the transportation industry forward,” he said. Navistar International Corp. is a leading manufacturer of commercial trucks, buses, defense vehicles and engines. Rush Enterprises, Inc. owns and operates Rush Truck Centers, the largest network of commercial vehicle dealerships in the United States, representing numerous truck and bus manufacturers. SIU Carbondale provides one of the few automotive technology baccalaureate degrees in the nation and the only four-year degree of its kind in Illinois. Established in 1952, the competitive admission program has 285 national and international students with more than 80 graduates each year. More information about Navistar is available at http://www.navistar.com/navistar/. More information about Rush Enterprises is at http://www.rushenterprises.com/. Additional information on SIU’s automotive technology program is at http://automotive.siu.edu/.